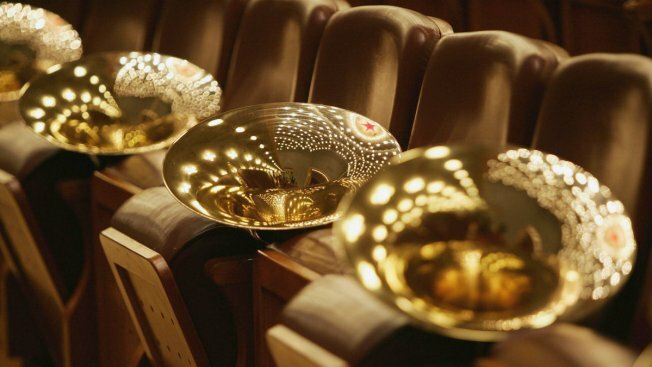 Trumpets of a band rest on chairs. It may seem odd to phrase it this way, but trumpeter Eric Berlin isn't one to blow his own horn. Berlin, who teaches in the department of music and dance at the University of Massachusetts has been nominated for a 2015 Grammy Award for Best Contemporary Classical Composition. But he likes to share this honor with as many of his colleagues as possible. "I feel extremely proud of the work the students in the UMass Wind Ensemble, my fellow soloists and conductor James Patrick Miller did making this whole project such a success," he said. "The entire CD is a documentation of my commissions from the past decade, but centered around this particularly important work by Stephen Paulus." The nominated recording is Paulus' "Concerto for Two Trumpets and Band" from Berlin's album, "Fantastique - Premieres for Trumpet and Wind Ensemble." It features the UMass Wind Ensemble directed by James Patrick Miller and trumpeter Richard Kelley of the New England Conservatory of Music. The album also includes pieces recorded with UMass faculty members Jeffrey Holmes and Greg Spiridopoulos. Berlin chose the concerto piece because of its beauty and mystery. "Stephen is been best known as a great choral and opera composer, and his Concerto is beautifully vocal in a way that really speaks to me," Berlin said. "From the beginning, his approach to using two trumpets is incredibly inventive. Instead of immediately assaulting with pyrotechnics, he draws the audience into an intriguing game of 'where is that coming from?' as a single pitch is passed between the two soloists." Berlin said the concerto's second movement is a soaring "beautiful elegy" for Paulus' younger brother, who passed in 2003. "The final movement culminates in a brilliant and heroic finish complete with antiphonal trumpets," he said. Berlin noted that Paulus was known not only a gifted composer, but also as an advocate for contemporary classical music. This probably helped get the piece noticed, Berlin said. "Stephen was one of the kindest and most generous people in classical music," he said. "He was well-known from his compositions, but also for his advocacy for all contemporary classical composers through his American Composers Forum. His name alone gave it credibility to stand among the significant competition, but all of the other pieces had to fall into place as well." The fact that Paulus has just passed away last fall added to the emotion Berlin felt when he learned the piece had been nominated. Berlin was sitting at Starbucks in Lincoln Center in New York City on Dec. 5 when he learned he heard the news about the nomination. "The L.A. Times had been releasing nominations sporadically a few at a time throughout the day. Suddenly the entire list was up. I broke into tears when I saw our nomination for Best Contemporary Classical Composition," he said. "I immediately called my wife Alison at work and blubbered something nearly incomprehensible into the phone. When I hung up, a woman sitting nearby came over to me with a stack of napkins and asked 'Are you all right?' The tears were a complex mixture of joy and sadness. Seeing the UMass Wind Ensemble on that list was a global validation of what we do, but I was heartbroken that Stephen would not be able to enjoy the honor in person."